Born in Vancouver, B.C. 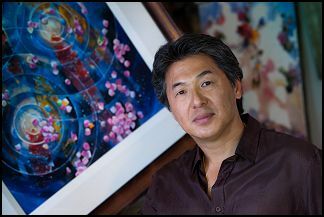 in 1956, Alex Fong's interest in art began at a young age. However, it was not until his study of interior design that he discovered the medium of watercolour and the freedom of colour and expression that matched his vision of the world. Alex's early works reflected a traditional oriental technique. As his talents flourished, Alex developed a personal style that has since become his hallmark. Alex's paintings are a kaleidoscope of light and colour – a bouquet of wonder and whimsy. The sense of delight that accompanies them draws the viewer in for a closer look. His translucent, impressionistic paintings are distinguished by a parade of coloured flecks that he calls "confetti" which represent his celebration of life. The result is an exquisite balance of spontaneity and grace. Though Alex's artistic vision continues to evolve, his works reflect a fresh and youthful outlook. Alex Fong's work has attracted the attention of fine art collectors since the early days when he exhibited at Vancouver galleries, and then through his years as a touring member of the Western Lights Artists Group. Alex has exhibited in both Canada and the U.S. for over thirty two years. 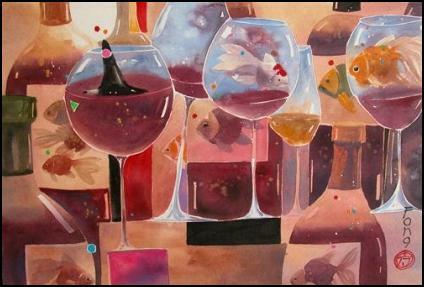 His watercolours are featured in both private and corporate collections throughout the continent. Alex has developed close relationships with the art community in Alberta, and exciting artistic associations at his home in the Okanagan, with the Valley's wine industry and charitable organizations. He participates in celebrations of art, food, music and theatre, reflecting his deep commitment to the cultural nurturing of his own community, and to art education. Alex Fong's artistic vision continues to evolve, his work reflecting a delightfully fresh and youthful outlook. "A child views the world with optimism and wonder. That is what I hope to accomplish with my art. Each day, I look forward to creating something new and wonderful" he says. "I paint to make people feel good, and put a little joy into their lives."